A decent drama / romance about two families in the fifties and how the lives of the children crossed paths over and over again throughout the years. Inventing the Abbotts is meant to be like a Shakespeare play transplanted into the 1950s. The most obvious hints are of the play Romeo and Juliet, where two families were enemies and yet the children of each family ended up dating despite their parents’ objections. Things aren’t quite the same here, but they are certainly similar. And then there are the multiple siblings and the secrets from the past that end up coming out in small increments at a time. All of it is meant to feel like this great elaborate play, but it really isn’t much more than what is on the surface. The Abbotts are the family next door. They’re the Gatsby’s, complete with their enormous parties that they throw under tents outside in their yard. And the other family, the Holts, just watches from next door and think of how spoiled the Abbotts are. The Holts are the family from the wrong side of the tracks. It’s two boys and their mom, watching and drooling over the Abbott girls. The Abbott parents are super rich and have three beautiful daughters, and the Holt boys can’t help but fantasize about them. Joaquin Phoenix and Billy Crudup play the Holt boys. Liv Tyler, Jennifer Connelly, and a third and lesser-known older sister play the Abbott girls. At the start of the movie, the older brother, Jacey, (Crudup), has a monster crush on Eleanor Abbott (Connelly). He goes to her parties and dances with her, trying to make every moment count before her wealthier, preppy boyfriend cuts him off. Jacey is the bad boy that Eleanor wants, and the more her father, played by Will Patton, objects, the more she wants him. She shows up at his garage one day and tells him that she’s not really with that preppy boy from the party. Instead, she wants to be with Jacey. The two of them go about sleeping together until one day the father, Lloyd Abbott, catches them and ships Eleanor off to a mental institution. For the longest time, the movie keeps it a secret where she has been sent away to, and it’s all the more scary because of the way she just ups and disappears. We get voice over by an actor who is meant to be an older version of the Joaquin phoenix character, Doug, and he tells us how Eleanor one day just vanished. Jacey goes off to college and Doug is left at home to start up a fling with the youngest Abbott daughter, Pam (Liv Tyler). This part of the movie is the worst. Liv Tyler is incredibly annoying with her whiney voice. This movie was made right when she was breaking out as a movie star, and she acted exactly the same in every movie she was in. empire record in 1995, that thing you do in 1996, and then inventing the Abbotts in 1997. In every one of those movies she was the sweet, innocent girl who got used, mistreated, and had that whiney, whimpering voice to make us feel sorry for her. It was more annoying than anything else. Doug and his relationship with Pam is the slowest part of the movie and liv Tyler’s lousy performance is only one of the reasons. Another is that there is no conflict here. They are both too good. These are the two nice and innocent characters, and compared to what’s going on between Jacey and Lloyd Abbott, these two are like little children. Luckily there are other plot lines to follow right around the corner. There’s the one about Jacey returning from college and dating the oldest Abbott daughter (does this feel repetitive to anyone else? ), and once again dealing with the father’s objections. This storyline still ends up being twice as much fun as the phoenix-Tyler story just because of the characters that are involved. When Lloyd Abbott surprises Jacey with a sort of ambush on the docks, it’s an exciting moment, even if it doesn’t lead to violence the way one might expect it would. I was shocked Abbott didn’t have some tough guys there with him waiting to beat Jacey up. Then I thought that maybe the only reason Pam agreed to help her father was because he promised her that he would be there alone. And then I thought that the movie should have somehow mentioned that. Don’t have the goons on the docks, fine, but give us a reason. The best storyline of course is the secret about the back-story between the parents. Lloyd Abbott and the Holt father were business partners of sorts and Abbott dared the father one night to drive on some thin ice. The father’s car ended up crashing through the ice and he died. All of that is no secret at all. But the aftermath of what happened is where things start to get good. One day while out on the road towards the beginning of the film, Jacey and Doug are sitting around drinking beers and Jacey tells his brother about how Lloyd Abbott stole their father’s invention. He explains that it’s the reason why the Abbotts are rich and they are poor. Later on we get another piece added to the story for us, involving an affair. And still later, we learn the truth about the whole mess. I love how this story unfolds slowly, over the years, and is all back-story and hidden secrets. 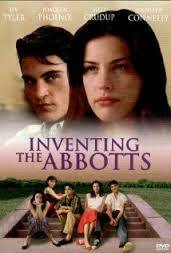 Inventing the Abbotts is not a great movie, mainly because it moves too slowly. The Doug-Pam relationship is incredibly dull, and unfortunately it becomes the sort of central relationship of the movie. The Jacey character is much more fun, but he’s only on screen for a part of the time. Similarly, Lloyd Abbott makes for a great villain, but there are whole lengthy portions of the movie where he’s nowhere to be found. The movie has some good elements going for it, especially in the ways the plot twists unfold, but there are also plenty of slow moments to go along with it. It’s an okay movie, worth watching, but certainly something that could have been better.